Past Clinic: Indiana Green Flag: Never Slow Down! In partnership with Indiana Swimming, The Fitter and Faster Swim Tour is coming to Newburgh, IN for the annual Green Flag Clinic Series. Learn how to maintain your momentum between the flags and the wall from Olympic gold medalist Nick Thoman! This clinic is designed for participants who are new to swimming and have been competing for 3 years or less. 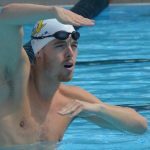 Off the start, into the turn, and out of the turn, maintaining momentum is an important skill for every swimmer to work on. 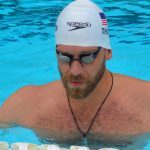 At this Green Flag swim clinic, participants will learn from Olympic gold medalist Nick Thoman how to maximize their speed between the flags and the wall! STREAMLINE: A perfect streamline is more than just putting your arms over your head! Every muscle in your body, from fingertips to toe tips, should be engaged and strong. Proper posture matters and it will help you move through the water with less drag. You'll be amazed at the difference a perfect streamline makes in your swimmer's times! FLIP TURNS: The faster you go into the turn, the faster you'll come out of the turn. Use your momentum to flip over faster and bounce off the wall. Nick Thoman is an Olympian due to his precision and focus when he approaches every turn. Learn his technqiues to NEVER SLOW DOWN!